Following some research at Lambeth Local History archives, we can add some further information. We have another drawing by the architect and possibly builder of the Church, Mr WG Habershon, Esq. This view is at the top of the letter sent out to well-wishers and potential subscibers to the building fund for the new Loughborough Park Congregational Church by the Rev. D.A. Herschell dated February 1st, 1860. Clearly the house on the right was never built but the School at the back of the Church was built as we shall see further on in this post. The letter was addressed from 3 Barrington Road, Loughborough Road, home to the Rev DA Herschell and family. The Architect, Mr W G Habershon was both a developer and builder around Loughborough Junction. He was responsible for some of the Milkwood Estate and for the Milkwood Tavern. and in the same letter from the Rev. Herschell was a list of people who had already subscibed or pledged sums to the Building fund. Included in this list is a generous donation from W.G Habershon of £30.00 and another Haberschon, Edward donated £5.00. Having discovered and purchased the land at Loughborough Junction on a ninety-nine year lease at a modest rental of “£22.10s per annum. His congregation at Trinity Chapel raised £133 as a testimonial, and contributed £500 to the building fund for the new Chapel. He goes on to say that the Chapel is intended to hold 480 sittings, with a school and a vestry adjoining capable of accomodating 200 persons and that the cost of the entire building would not exceed £1,990 leaving a margin from the money of about £300 for lighting, heating, boundary-railing and road. On 7th July, 1863, the Rev DA Herschell once again sent out a letter soliciting funds, this time to raise funds to build the school shown in the architects drawings above. They were looking to raise £600 of which £400 had already been pledged. They organised Opening Services with guest preachers with collections at the end in aid of the Building Fund. And finally the Church published a “short sketch of our past history as a church” just on the Rev DA Herschell’s 30 year service. It summarized some of the history of the church to date as well as the Rev Herschell’s life. He was for seven years a missonary in Liverpool, then as we already know spent seven years assisting his brother Rev Ridley H Herschell at Trinity Chapel. He spent his holidays in Missionary and bible work on the Continent. In 1856 approx he founded the Society for Supplying Foreign Sailors in our Ports with the Bible. He was its Honorary Secretary all those years. They circulated 549,746 copies of the Bible up till 1889. In 1878, he erected Homes for Aged Christians of Evangelical Denominations, containing 20 sets of Rooms, costing about £4,000. They were known as Herschell Homes are still with us today in the terrace on Cambria Road, right hand side just before the Cambria Road viaduct. The Rev Herschell was one of five of his brothers who became Ministers of the Gospel. Two entered the Church of England, one of whom was massacred in the Gordon riots in Jamaica. Three were Congregational Ministers, Ridley – the father of Lord Herschell and Louis and of course David. The foundation stone of the Loughborough Park Congregational Church was laid on May 22, 1860 and it opened on October 23. In November that year a Sunday School was formed and in December the first members of the Church joined. A management commitee ran the Church for 5 years until the first Deacons were elected. The School premises were enlarged in 1863 and the Chapel enlarged in 1879. In 1884 an assistant was engaged, the Rev. WH Richards was elected to the postion. He stayed until March, 1889 when he accepted the Pastorate at Farnham, Surrey. 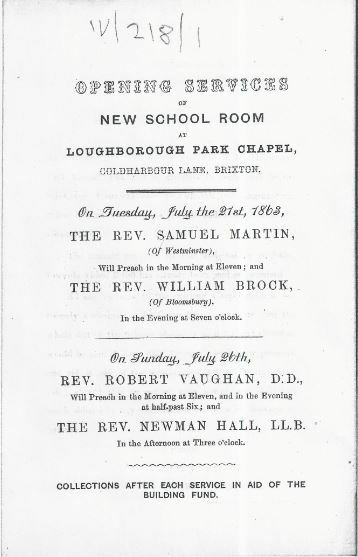 A second enlargement of Sunday School and the Class rooms was undertaken in 1888. It gave them plenty of space for Lectures, Working Men’s Meetings, Band of Hope as well as the school. In 1888, approx Mr John Alfred Joyce was chosen as Assistant Minister. At this time the Herschells lived on Overton road and the Rev Joyce on Loughborough Road. Lambeth Archives in Minet Library. This entry was posted in Churches, Loughborough Park Congregational Church. Bookmark the permalink.